For years, pilots have endured a cryptic, wall-of-text preflight briefing. 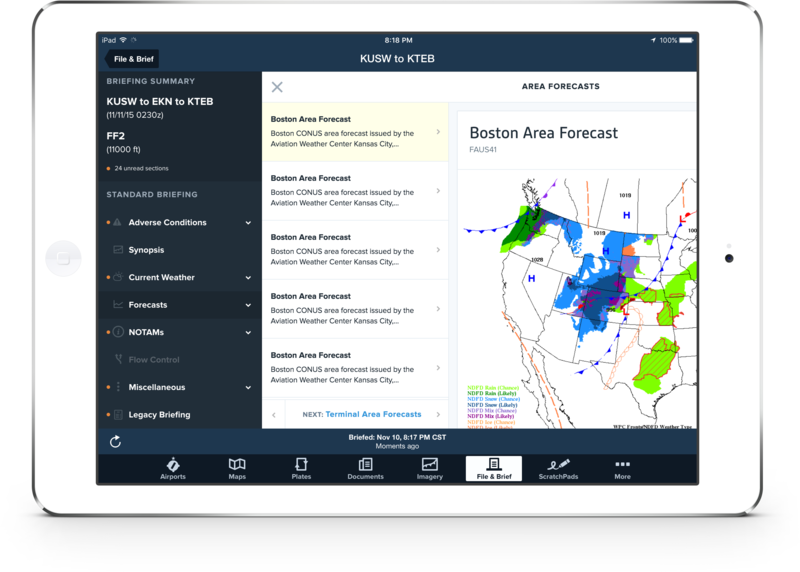 With ForeFlight Mobile 7.4, we are thrilled to introduce ForeFlight Briefing—a graphical, translated, interactive briefing that helps you better visualize weather and related flight information along your proposed route. This release also delivers an enhanced AIR/SIGMETs map layer and new Track Log capabilities that allow you to automatically record your flights. 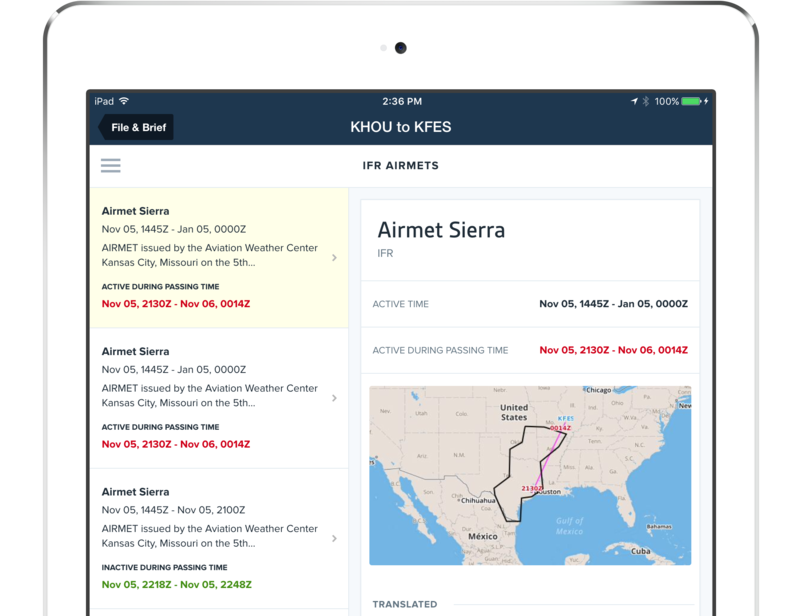 ForeFlight Briefing is a standard briefing with content derived from approved government sources. It includes all the elements of a standard preflight briefing prescribed by the FAA—adverse conditions, synopsis, current conditions, enroute and destination forecasts, NOTAMs, and more—delivered in a visually elegant design for enhanced readability. With this next generation briefing format, we believe you will enjoy and get more from the preflight briefing. ForeFlight Briefing is seamlessly integrated into the ForeFlight Mobile app and is presented in clearly organized sections, making it simple to tap through each element of the briefing in a logical sequence. Translated and raw text options are available, as well as full-color graphics, which help you better understand and consume briefing information. Also, colored dots used in conjunction with METARs and TAFs give you an at-a-glance view of current and forecast weather. In the screen shot above, green represents VFR, blue is marginal VFR, red is IFR, and magenta is low IFR. The briefing is mobile and portable—once the briefing is retrieved, you do not need an Internet connection to access it again on the go. In addition, after you file your flight plan you can click the link in your confirmation email to view the briefing on any web browser. In addition, ForeFlight Briefings are timestamped and stored on your iPad and iPhone, and in the ForeFlight cloud, to record that you obtained weather and pertinent NOTAMs in compliant manner with 14 CFR 91.103(a) preflight action. ForeFlight Briefing is available to all customers with ForeFlight Mobile version 7.4 on both the iPad and iPhone. Customers with 7.4 installed will be automatically given the opportunity to use the new format the next time they brief a planned flight. For more information visit foreflight.com/briefing/. The refreshed AIR/SIGMET/CWAs Map layer now includes graphical Center Weather Advisories (CWAs) alongside AIRMETs and SIGMETs, giving you a better picture of current conditions. SIGMETs are also expanded to include global coverage. Scott Dennstaedt, our in-house Weather Scientist, has written this blog post and this one to provide more insight on how to use these helpful weather resources in your everyday flight planning. Have you ever been half-an-hour into a flight and realized you forgot to tap the Track Log record button? Now you don’t have to remember! With 7.4, we’ve made it easier than ever to record your flights. Track Log shown in Google Earth. Track Logs can automatically start recording when you take off and, after touchdown, automatically stop recording—ensuring that every flight is captured for your post-flight debrief. When you get back to Wi-Fi, Track Logs are also automatically uploaded to the ForeFlight cloud for safekeeping and for easy access from your other devices. The Track Log includes your taxi time so you can have a complete record of your time in the cockpit — on and off the ground. ForeFlight Mobile 7.4 supports Spotlight Search, Apple’s smart search feature, which now displays relevant airport results from inside ForeFlight Mobile right on your device’s Home page. To access Spotlight Search, swipe from left to right on the Home page of your iPad or iPhone. Begin typing an airport name, identifier, or city name and results from ForeFlight Mobile populate the search results list. Tap the desired airport search result and ForeFlight Mobile opens directly to that location in the Airports view. To continue searching, tap “Back to Search” in the upper left corner of the screen to return to the Spotlight Search view. Spotlight Search is available on iPhone 5 and up, all iPad Air models, and iPad Mini 2 and up. ForeFlight Mobile 7.4 is a free update available on the App Store. This entry was posted in 2015 ForeFlight Year in Review, Software Updates, Weather and tagged apple ios 9, aviation, foreflight, ForeFlight Mobile, iPad, preflight briefing, Weather by ForeFlight. Bookmark the permalink.